A friend was meant to be coming for tea today. I have prepared all the vegetables for garlic roast lamb only to have him text to cancel. This means that we are free to go to the pub quiz after all. Which would normally make me happy, only I've geared myself up to a night in with good food and cheap wine. So now I'm feeling disgruntled and the quiz (which is a regular evening out for us) is completely unappealing. I have dilemmas - please help me out! Do I: Cook the roast (which I've prepared but not started to cook) just for the two of us or cook a ready-prepared stir-fry which is use by today? Do I: Have a drink of gin and tonic to try to cheer up a bit or not drink so I can drive, making going out later less effort? Do I: Go to stay with a friend of a friend after my gig next weekend then drive home with a colleague who lives in Glasgow too, or let him stay with his friend and make his own way home, and drive myself back home the same day? In case you want more information to make this choice for me - the gig is a 2hr drive away, the friend of a friend is OK but I don't particularly want to stay with him, and the colleague who lives in Glasgow is the friend who cancelled on me today. I thought I should say I'm back to normal and thank you for your well wishes. We went out last night for a few beers and ended up in a curry place having a buffet. I then met a friend and we headed home, where inevitably we chatted for far too long and went to bed very late. Before bed I asked my boyfriend NOT to leave in the morning without either making sure I was up (to do this myself) or getting stuff I needed out of the car. The stuff was actually a waterproof jacket and my normal coat. When I woke up I looked around the house for my coats. Nada. Grr. So rather than preparing for the day I had to get two buses to Paisley to meet him and retrieve my coats. I took the car home, which we had been trying to avoid as I was going to a day out at the Brownie campsite and wasn't sure I'd be back in time to pick him up for work. By this point I felt fine about this situation, as he'd taken the coats despite my emphasizing the importance of the waterproofing for campsite days. His own damned fault. The Brownie day then started off badly. I was only taking a couple of kids but they both turned up without wellies, and one had no coat. Long story, which I'll save for tomorrow. It picked up though and despite getting very very very wet and pretty cold the girls had fun and they sang all the way home on the bus. Overall though I am now satisfied after a lovely glass of G&T, but am shattered so will head off to bed. See you tomorrow. I wasn't well yesterday - just a bug. Anyway - no inspiration just now, hence no posting. hmm... well I had been concerned as our numbers were down last week. But I had thought hopefully it was a blip. This week we were about 6/7 kids down again. When I think about it I know the reasons for most of them: One has been moved up a class in swimming and isn't sure what to do about it. For now she's doing swimming. Her friend has stopped coming too. One is away representing Scotland in cheerleading championships. Two haven't been for ages. One has started badminton on Tuesdays. So actually - there's only really one that has surprised me a little... and I'll see her sister tomorrow at Rainbows. I think it's time to fill some spaces. I had a tag. Honest! Can't remember the meme though which upsets me as I was quite excited. There's no point in racing round all your blogs because you all write often and it was a wee while back now. If it was you - can you let me know please? Cadbury's Flake: I hate this advert so much that it ensures I will definitely NEVER again purchase this chocolate bar. And that's the idea of advertising isn't it? To clarify(as I have caused confusion for some... sorry!) It's entirely down to JOSS STONE - the STUPID FAKE AMERICAN ACCENTED UP HER OWN BUM fool. I didn't get a picture - so I'll just have make it again I think. It was delicious - tender and just pulled apart. The onions were good too (honest, Travis). My little sister is staying this weekend. We've been out on the town and today I am cooking a slow roast pork joint. Get a massive hunk of pork. Peel and half loads of onions. Lay the onions in a roasting tin. Sit the pork on top. Cook it at high for 40 mins, then reduce to 120degrees and cook it for as long as possible (literally 8 or 9 hours apparently). I have never tried it before and currently my whole house reeks of onion. I am hoping the smell improves as it really isn't helping my hangover. On a completely separate note we just watched the Canadian doubles figure skating team on telly, and they were BEAUTIFUL. Thirteen times I have actually arrived at work on THURSDAYS. 13. And the target time I have failed to achieve on a weekly basis? 9am! You never know - maybe today's the day? I got the time wrong, they came at 6.15 (as arranged by me). They were as far from rude as can be. I feel bad! I had a new pupil booked in for a lesson today - a trial lesson actually. She has not turned up. I am quite irritated, as I have tidied up (as I always have to for a new pupil.. my standards slip after they've been taking lessons for a wee while). As far as I am concerned they owe me the cash anyway. I wouldn' have been able to take any other pupil in this slot as they reserved it 2 weeks ago. WALES BEAT ENGLAND, SCOTLAND, IRELAND, ITALY AND...... FRANCE!!!!!!! I can't believe I forgot to tell you this! Wales are the winners of the six nations AND they won it with a Grand Slam. Today is our library meeting day. I must remember: That the time changed. To go and sort out the hunt etc this afternoon. Really hope they enjoy it! Update - It was cool. I did the scavenger hunt... that occupied them for AGES. Then we worked on some elements of the booklover badge, showed them how to log onto the internet (using the Brownie website!) and then gave them free stuff the library dug out for them before letting them check out books and head home. The library staff were great. The library inside was great. Outside, however, it looks so dodgy. My pack is not in the best part of town, and this was not a nice part. OK this is not going to be a hard post for me. I am a trumpet player. It is common for brass players to drink.... And I do. Last night I played a gig that I loved so went for a couple of beers afterwards. My evening was cut short by a fire alarm in the building the bar was in. We were evacuated.. but after two pints I was dying for a pee. I jumped in a taxi thinking 'get me home as quickly as you can!!!'. That should really be the end of the story but when i got home after chatting to my (very obviously shattered) boyfriend for a while and making a sandwich I realised it was blogtalkradio time and Turnbaby would be on. Now - I ask any brass players in the blogosphere - What is the solution to embarrassment? Kyra is on after Turnbaby on Sundays so over I went. And the fabulous Narf introduced me to the Kyra Sutra drinking game. Wey Hey! My boyfriend retired to bed (giving up on trying to get conversation out of me as I was clearly in a chat-room trance). I continued the game for a full hour and a half. I got through a bottle of wine.......... after leftover wine and 2 pints of beer. Imagine how I feel today? I hereby solemnly swear that I, Topchamp, will make time to CATALOGUE my music. This will therefore avoid situations such as the current one. At the moment I am rooting through every piece I own on the off chance that there may be trumpet trio music I have missed there for a gig we have tonight. Missed it tonight for a concert. Would rather have been making the wind-up Easter egg men!! This is amazing. There's a website www.horncollector.com on which a chap lists the weirdest instruments I have seen. This one looks COOL! It's a 'double bell sax shaped trumpet'. I want to try it. And here is Bob the Builder with his catchy tune... "Bob the Builder, Can he fix it? Bob the Builder, YES HE CAN!". Quality. This weekend WALES BEAT IRELAND in the Six Nations. Only France to go.... could be a tough one. Just look at this mad cat.... Yesterday our big fat lazy lap cat caught a mouse! A real live mouse. He waited for one of us to come home - and met my boyfriend on the doorstep, mouse in chops. On seeeing my boyfriend, he dropped the mouse which scuttled of the top of the stairs which go up to our flat. And Dixie (fat cat) RAN after it. It's truly an event. A first. I am impressed! Since the mouse episode he has slept, and slept. He didn't move when I got up this morning and just now he is dozing on my knee. Hunter indeed. Today he left while I was in the shower (it is now only 7.30 so I wasn't late up). He did not say goodbye. This meant that there was no opportunity for me to say 'WAIT, my shoes are in the car'. Which they are. Or 'WAIT, my phone is in the car'. Which it might be (can't find it). Or EVEN to say 'What's happening later on... are you coming into town early or will you meet me at half past six?'. Because tonight I am working at half past seven. And he volunteered to come and see the show. So although he has my car and is working until 6pm I will have to wait for him. Which is fine... if I know that he'll be there on time. Which I don't. AND he just didn't answer his phone. Which probably means he's driving. Sometimes I think I should just live by myself. That would save stress. The girls enjoyed drawing stuff on BIG bits of paper. Ok so our plan to beat the crafty genius of the Rainbows didn't quite pan out but we are not yet defeated. Our second strategy is brewing. Dollop it onto baking paper and shape into nest-like piles. 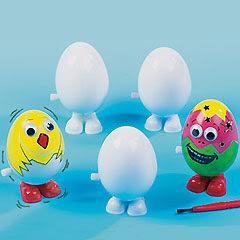 We had time to do the egg and spoon racing (using cadbury's cream eggs and a teaspoon in a tag-team format). During the pow-wow I brought up the library and the idea of a scavenger hunt. They loved the idea. We then had a few minutes for singing. They chose Found a Peanut again. I really need to teach them some new songs!! Overall though they were all really happy tonight and seemed to have fun. Flatteringly when they asked if I was coming on Brownie camp with them (of course I am!) they cheered at the 'yes'. Oh - I got a new trumpet mute today too which I have spent some time playing with. It gives you a twenties sound... To me this is fun! I rang the library today as e-mail hadn't worked. They are quite happy for me to bring the pack but have said that they don't think the childrens' librarian will be available in the evening to do anything with us so it'll be up to us to think of fun stuff to do in a library. I think I can manage that but any suggestions of course will be gratefully received! My current thinking is a treasure hunt using the books - spine numbers and clues from pages hopefully. I have the day off so should be able to do it in the afternoon (which will reduce the risk of anyone checking the books out before we arrive). Tonight our plan is: Start off making pictures of themselves doing activities they enjoy at Brownies for a display on the wall (result of comment from rainbow leader that their wall is better than ours. Not for long, lady!). Then we have easter nests to make - that's really easy so it should be pretty quick. Followed by an egg and spoon race if there is time. Well again the guiders' forum came up trumps! In a couple of weeks I am unable to use the Brownie hall again. We had no meeting last week because we couldn't use the church hall. This worked out ok because I had a gig and couldn't make it anyway. However in 2 weeks time we can't get in again and I'm aware that this will affect our continuity as a unit. I would rather that we keep going all term than stop and start like this. So I asked for suggestions for things we could do. I couldn't think of anything - I'm loaded with a cold and am working many hours for the next few weeks so have just been feeling sorry for myself. Anyway - someone suggested we go to the Library. Which actually sounds like a great idea. So I'm going to try it - and see if the library go for the idea. Fingers crossed. If not the other suggestions ranged from cinema etc (which costs money so we won't be doing it) to surveys at the supermarket (which we could do).